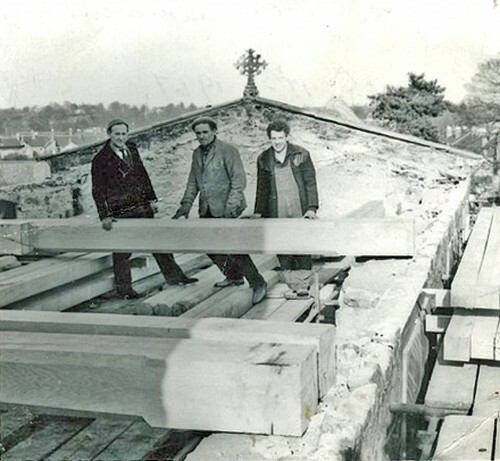 After the major fire in the Church in 1965, the roof of the nave had to be replaced. This work was undertaken by Wm Corah and Son of Loughborough. This photograph belongs to Stuart Musgrove, whose father, Thomas Musgrave, (on the left) was the foreman. Stuart remembers his father telling him that no power tools were used and the oak beams were very hard to screw into! The men carved their names into the new beams. See also artefact 1693. The other men are believed to be Pat (in the middle) and Richard Harbour (right).